February 20, 2016 March 31, 2018 - by Gold Cochin - 7 Comments. Before I start on this article I want to be clear on the subject what chicken do when they are bored. When your chickens sit in one place and they are not pecking or playing it does not mean that they are bored, but that they are enjoying life. We have all felt that moment when you just want to sit and relax. They sit and relax their muscles and simply watch some of the entertaining parts of the world around them that we humans have forgotten to enjoy.What chickens do when they are bored they start going at each other, in most cases bullying the ones at the lower end of the flock. They get aggressive towards each other and towards the other animals around them because of the extra energy they have. So what we at the typesofchicken.com team are going to do is help you to keep your chickens from going at each other. What I have seen most people do when their chicken get aggressive is start running into them and scaring them off. I do not approve this method because I don’t consider fighting violence with more violence at all productive. This will make your chickens even angrier and most likely they will feel the need to run off on you the moment you are not watching them. Remember chickens have their own way of communication. What you should do is give them something else to do, get them something new to peck at – straws, some new food or treats. In other words, try to keep them as busy as possible. When they get tired a bit they will go back to their former selves in no time. Why is making some toys for your chickens a great idea?! As much as any pet you can have chickens also enjoy their toys, so as a part of this article we at the typesofchicken.com decided to give a few toy ideas for your chickens of any age. The thing on a string – The title says it all, get some cabbage or something round that they enjoy pecking at and put it on a string – lift it as high as your chickens are and watch them peck away at it. The sight of them just going around and passing it to each other is similar as when you watch children playing with a ball. 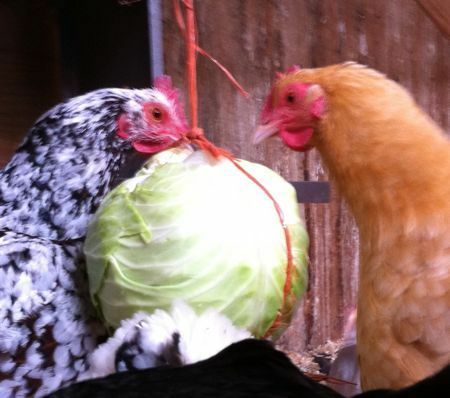 You can also attach a bell below the cabbage or whatever you are giving them to peck. 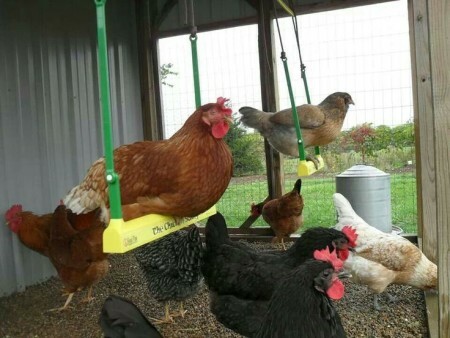 A Chicken Swing – Many of the chicken enthusiasts that I know are very satisfied from the simplicity and usefulness of this toy, you will need a chain, some tree branch or some long piece of wood and some nails. Attach the chain at the sides of the branch or the piece of wood then attach the chain on something higher and make sure the branch is as horizontal as possible and above the ground enough so your chicken can jump on it. Also, it would be great if the wood is long enough so two or three of your chickens can jump on in and swing together. 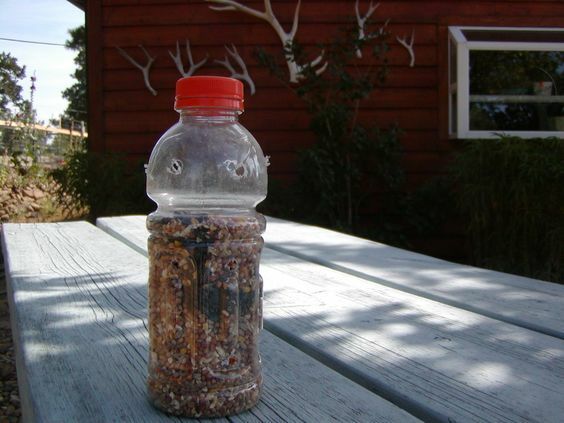 The pecking bottle – Get a plastic bottle and fill it with their favorite treats until its half full, then make a few bigger holes on one side of the bottle and let them play with it, so when they turn the bottle around the treats will fall off. This is also one of the funniest things to watch chicken do. Be patient when introducing your flock to their new toys, they will need some time to figure out how they work – but when they do you will have the pleasure of watching playful chicken at their finest. 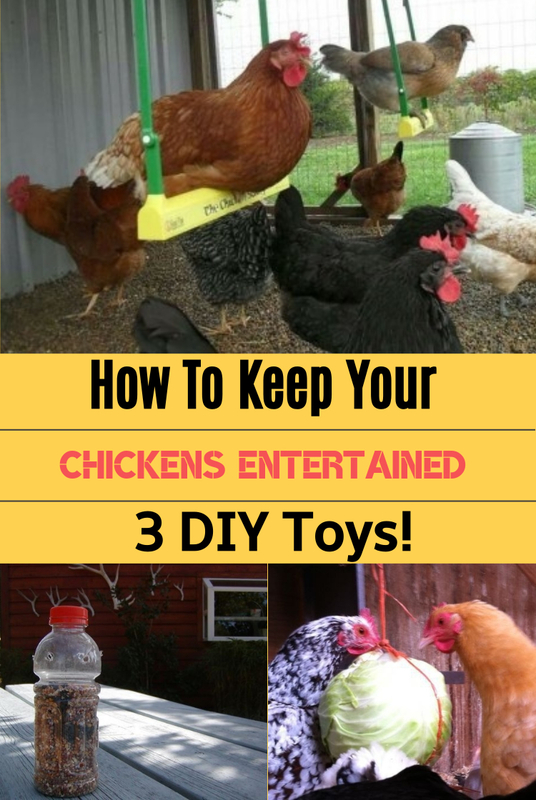 For more fun and enjoyment with your chickens, check our article on Chicken Toys Part 2. Previous Article 3 Easy Tips on Keeping Your Chickens Happy in The Summer! Next Article The Language of Chickens & How do they talk to each other! Have to try all of these. I think my girls will enjoy all of them. Thank you for sharing. Thank you for your feedback. I hope this article helped you a lot. This is great! I don’t even have chickens, but can see how beneficial play can be for them! I am introducing new chooks to the pen this week so I’m hoping these toys will stop the older ones from hassling hem too much. Just made the swing and the bottle. They’re now outside in the field, but can’t wait till they’re back in their pen! At what age is it good to introduce chicks/chickens to toys. Mine are in that teenage phase and whenever I add something new to their pen (they are not yet outside) the ones who are not super friendly with me still run around and squawk. I just don’t want to stress them too much.